Why we chose to fundraise for Claire House? We chose to start fundraising for Claire House after our Managing Director approached a member of the team there, to find out if there was anything that they needed our help with. Following a couple of meetings about the kind of things Claire House needed our help with, one of the lovely ladies at Claire House invited him in to do a tour of the hospice and from that moment, Ken was gripped by how moving it was, and how very different it was to what he expected. Most people expect a hospice of this nature to be a very sad, deeply upsetting and distressing place, but Claire House is different. Yes, Ken was moved greatly and very emotional after his visit but he came back feeling inspired to do anything he could to help. There are a number of members of staff here at Heightsafe who have had relatives in hospices, Ken’s father being one of them, and the atmosphere at Claire House is so different to the majority of them, which is what has encouraged us all to get involved and offer any support we can to all the wonderful children and families there. We want to help put back into the community at do all that we can to support those families who find themselves in the incredibly difficult and unimaginable position where one of their children is terminally ill. Claire House has family at it’s very core and this is something we cherish so greatly at Heightsafe, with family being at the very core of our business too, so it seemed like a perfect fit and we hope to give as much as we possibly can to this this incredible charity and offer all the support we are able to. 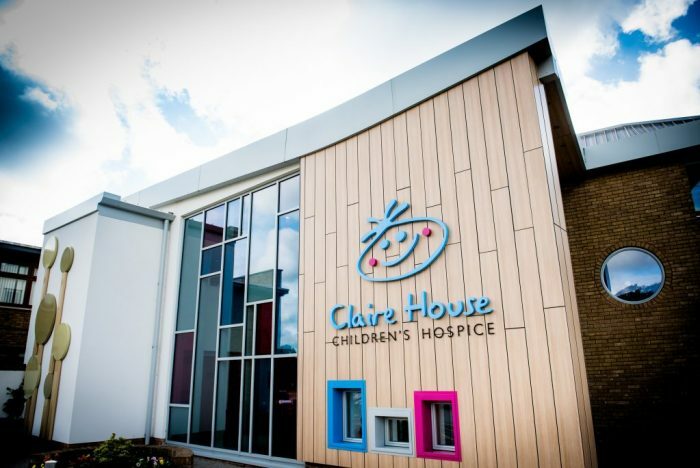 The story of Claire House Children’s Hospice is the story of one special little girl named Claire. Claire Louise Cain was five years old when she moved with mum Christine, dad Bobby and big sister Tracey from Liverpool to the Wirral in 1985. Life was normal; Claire and Tracey, seven, both settled into their new schools and enjoyed going to Brownies together and in October there was another addition to the family when Jennifer was born. Two years later, with Christine expecting the Cains’ fourth child, Claire suddenly became seriously ill and was diagnosed as having a malignant tumour behind her nose and eye. The family’s routine now included regular hospital visits, with Claire refusing to complain despite undergoing months of chemotherapy and radiotherapy treatment. Even when she lost the sight in one eye, her hair and most of her teeth, Claire kept on smiling and laughing, and was happy and positive throughout. When Kevin was born in February 1988 Claire was a very proud big sister, enjoying pushing him in his pram and taking her new baby brother to the hospital to show him off to her friends. Two months later, at Easter, scans showed that Claire’s tumour had grown and despite undergoing a new type of chemotherapy, Claire died in hospital in July 1989, just a couple of weeks before her 10th birthday, with her mum and dad at her side. Claire’s final hours led directly to the hospice we know today. With Claire in hospital, the whole family could not be together, as they would have wished; taking Claire home would have meant sacrificing the support they received at the hospital. The Cains’ determination that families of other children with serious or terminal illnesses would not face the same impossible choice led to Christine and Bobby forming the first Claire House committee, with an aim of raising funds to build a much-needed children’s hospice for the Wirral. Bobby and Tracey started the fundraising with a car boot sale which raised £96, the family topping it up to £100 and opening the first Claire House bank account. In the years that followed, Claire’s family and friends organised and took part in fundraising events and dealt with many individuals and groups in the local community from the Brownies to large businesses. The family’s house was filled with merchandise, raffle prizes and anything else that could be used to raise money, and the fundraising team grew to include one paid fundraiser and a clerical worker, who were supported by an expanding team of volunteers inspired by Claire’s story. Ten years after Claire’s diagnosis, and after many years of planning, committee meetings, fundraising events and location hunting, Claire House opened its doors in December 1998, complete with a bronze plaque designed by Tracey, Jennifer and Kevin. It is a combination of some of the things that made Claire happy and played a part in her life; music, funny hats, the Mersey Ferry (the last record she bought was Ferry Cross the Mersey), a bucket and spade, Mickey Mouse and much more. A lasting reminder of Claire, it takes pride of place in the entrance at Claire House and reads “made with love for our sister Claire by Tracey, Jennifer and Kevin”. The last word, though, must go to Christine and Bobby. They say: “This special place gives families a choice, the choice that we never had when our daughter was ill.